LANGLEY — The fourth new No. 1 of the B.C. senior boys Quad A basketball season? Say hello to the Port Coquitlam’s Terry Fox Ravens who have the honour and the target for the first time in almost four seasons (02.26.15). Surrey’s Holy Cross Crusaders fall out of No. 1 for the first time since mid-January, its four-week run the longest in-season run of 2018-19. Burnaby South and Lord Tweedsmuir have also held down the No. 1 ranking at the province’s highest tier. And while a shake-up in the Quad-A rankings is certainly no surprise based on this strangely beautiful season of top-tiered hoops, the juncture of the season at which it’s come is somewhat surprising. 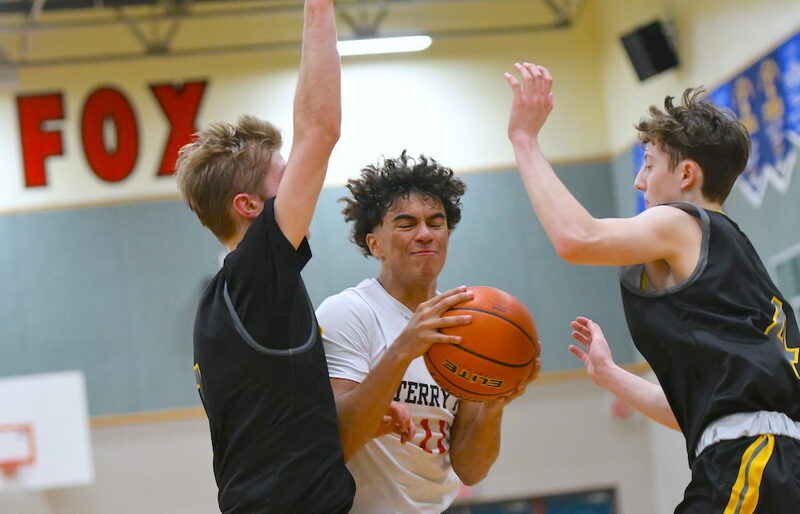 While most teams stay within their league schedules and prep for the start of the playoffs, Holy Cross, Oak Bay, Belmont, Kitsilano, Semiahmoo and St. George’s all played key exhibitions against each other, and if the results weren’t extremely close, they seemed to all be upsets. Of course this season, what qualifies as an upset? Triple A’s Sir Charles Tupper Tigers, Double A’s Charles Hays Rainmakers and Single A’s Glenlyon Norfolk Gryphons all managed to quell revolts at their respective tiers and carry their No. 1 rankings into a new week. Last week — Def. Gleneagle 103-50. This week — Open Thursday as host of Fraser Valley North championships vs winner of Dr. Charles Best vs. Riverside winner. Last week — Def. Alpha 95-74. Def. Burnaby North 93-54 in opening game at Burnaby-New Westminster league playoffs. This week — Open Thursday vs. Cardston (Alta.) at Kelowna-Western Canada Invitational. Last week — Def. Abbotsford 94-85. This week — Feb. 6 at St. George’s. Last week — Def. St. George’s 91-61. Def. Sir Winston Churchill 89-58. This week — Open Thursday vs. Sir Winston Churchill as host of Vancouver City Championships. Last week —Lost 99-69 at Oak Bay, lost 65-62 at Belmont. This week — Open Wednesday as host of Fraser Valley Central championships vs. Enver Creek. Last week — Lost to Semiahmoo 82-65. Def. Holy Cross 99-69. This week —Open Thursday vs. Winnipeg-Vincent Massey at Kelowna-Western Canada Invitational. Last week — Def. Abbotsford 107-95. This week — Open play Thursday as host of Fraser Valley East’s West Division championships vs. R.E. Mountain. Last week — Lost 91-61 to Kitsilano. This week — Feb. 6 vs. Vancouver College, Feb. 9 vs. Clayton Heights, Feb. 11 vs. Pitt Meadows. Last week — Did not play. This week — Open play Wednesday as host of Fraser Valley Southwest championships vs. Sullivan Heights. Last week — Swept three games on Vancouver Island southern swing. Def. Oak Bay 82-65, def. Belmont 85-83 (OT), def. SMUS 81-79. This week — Open play Wednesday at Tamanawis vs. Seaquam at Fraser Valley Southwest championships. Last week — Def. Claremont 79-74. Lost to Semiahmoo 85-83 (OT), def. Holy Cross 65-62. Def. SMUS 74-55. This week — Feb. 7 at Lambrick Park. This week — Open play Thursday at Fraser Valley East’s West Division championships at Lord Tweedsmuir vs. Chilliwack. Last week — Lost 80-76 to Walnut Grove. This week — Open play Thursday at Fraser Valley East’s East Division championships vs. Sardis. Last week — Def. Rutland 86-57. This week — Open play Feb. 7 vs. Edmonton-Ross Sheppard as host of own Kelowna-Western Canada Invitational. Last week — Def. Sentinel 104-39. Def. Handsworth 66-59. This week — Feb. 7 at Carson Graham. Open Feb. 13 at Howe Sound playoffs. HONOURABLE MENTION (alphabetical) — George Elliot Coyotes (Lake Country) (HM), 9 H.J. Cambie Crusaders (Richmond) (9), 8 Seycove Seyhawks (North Vancouver) (8), 10-tie St. Patrick’s Celtics (Vancouver) (10-tie), Westsyde Whundas (Kamloops) (HM).